THE THREE VALLEYS, FRENCH ALPS The World's Largest Lift Linked Snow Sports Arena! FRENCH “MEGA ALPS” SNOW TOUR! Vanoise National Park. We are the other side of the country and far away from Paris, over 6 hours. A trip to Paris is not practical/possible! PUT ON DEPOSIT NOW AND SAVE! Discounted group round trip flights Boston, USA to Geneva, Switzerland option. Swiss; Flight meals and drinks (including alcohol) included. Swiss; Second check-in bag with sports equipment (Skis/Snowboard & boot bag) included. First group gets early transfer to our hotel in Brides (Save 3 hours!). Depart Boston on Saturday evening/night. Arrive in France Sunday Morning. Return from France Sunday, arrive back in the USA same day, Sunday evening. Motor coach transfers to/from Geneva airport, Switzerland to/from our hotel in France. Travel time is about 90 min depending on traffic. 7 nights lodging in an awesome hotels Rated #1 & #4 on Trip Advisor! Limited number of awesome room upgrades available in both hotels. Free Wi-fi, Satellite television, Safe, etc. Price includes all local and airport taxes including fuel surcharges as of April 2016 (increases are not expected). A limited number of room upgrades and single rooms available. A $395 deposit and 2017 club membership, only $50 per year, required to secure your spot. Cost & payment schedule land only (no flights) along with the trip's terms and conditions. Cost & payment schedule including airfare along with the trip's terms and conditions. This is the lift map (No trails on the map, just lifts)! Select for larger version. All Three Valleys six day lift pass: 268€ ($295 approx., so $49 a day!). The warmly welcoming village of Brides-les-Bains is situated at the base of the French Alps’ famous Three Valleys (Courchevel, Val Thorens and Meribel), the world's biggest snow sports area. High speed gondolas bring you directly to Méribel, the heart of Les Trois Vallées. There is a lot to do in Brides les Bains, many not only enjoy the snow sports and nature, but also enjoy Brides les Bains because it is regarded as the number one slimming center and SPA in France! Brides-Les-Bains has retained its ambience and has plenty of bars and restaurants as well as a casino and two nightclubs. The resort has an amazing health club with solarium, sauna, spa bath, gym, whirlpool and Turkish bath. Other activities in the area include: Cross-country skiing, husky dog sledging, walking & hiking trails, paragliding, ice-skating, tobogganing, swimming, bowling and a lot more! Those not skiing or snowboarding can purchase a pedestrian pass which enables access to the hiking trails, walks, villages and slope side restaurants using many of the gondolas. Here is a web page with information from Meribel and Courchevel 1650. There is a lot to see and this is highly recommended as a great way to explore the Three Valleys. The Three Valleys area is very big, ski/ride from village to village! 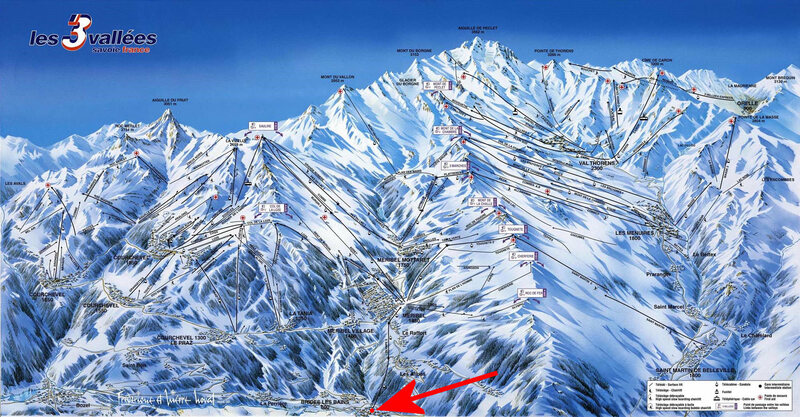 The “Trois Vallees” area is recognized as the biggest and best-linked ski/snowboard area in the world. With 600 kms of pistes (373 miles of runs), 200 of the most modern lifts available (Killington has 32 lifts), and tens of thousands of acres of off-piste terrain, it's sure to wear out even the heartiest, as it offers unlimited skiing an boarding for all levels in snow-sure terrain. There is more skiing and riding in this area than all the resorts of Colorado, Utah, and California combined! Snow Country magazine published that the six largest ski areas in the United States could fit inside Les Trois Vallées. That means that Killington, Vail, Heavenly, Steamboat, Squaw Valley and Park City could all fit inside the space covered by Les Trois Vallées with almost 10,000 acres left over! The expanse is breathtaking, the scenery is spectacular and the overall skiing and snowboarding is unmatched. Check out the stats: 200 lifts, 260,000 skiers transported hourly, 1,500 snow cannons, 2,500 Hectares of groomed runs, 320 Ski patrollers, 70 groomers and 1,500 Ski instructors. 50% easy runs (green and blue) and 50% advanced runs (red and black), with virtually an unlimited amount of off piste, so something for everyone. 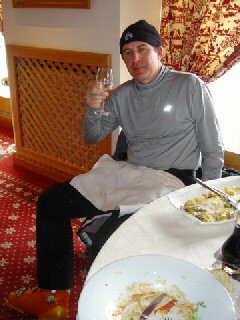 For many, one of the best features of the three valleys are the restaurants! There are a great variety of restaurants, from inexpensive pizza and "take-a-ways" to high end Michelin star gourmet French restaurants. Lunch options include packing lunch and having a slope side picnic (nice), eating a sandwich on the fly in one of the gondola rides as you push for the maximum vertical, to eating a long lunch at one of the many gourmet restaurants. Slope side gastronomic/gourmet restaurants include: L'Oxalys, Val Thorens, La Bouitte, St Martin de Belleville, Le Bateau Ivre, Courchevel, Le Chabichou, Courchevel and Le Farçon, La Tania. They are amazing and expensive, so bring your appetite and your wallet! Tentative Agenda: - More details soon. Excursions to; Paradiski (La Plagne/Les Arcs) and/or Espace Killy ( Val d’Isere/ Tignes)! - HELI transfers available! 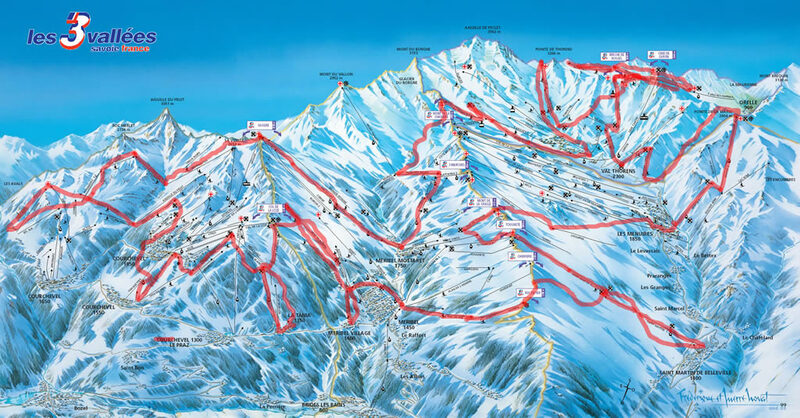 The Three Valleys Escapade - 27+ different lifts, more than 12,000 meters or 42,000 feet of vertical. This is an Everest and a half. You are eligible to receive a certificate & badge if you achieve this over the week (small fee). Some of our crazy members are going to try and do this in one day!